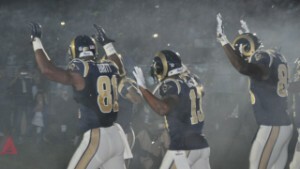 (CNN) -- The NFL has reportedly denied a request by the St. Louis Police Officer's Association to discipline St. Louis Rams players who showed the symbolic "hands up, don't shoot" gesture during pregame introductions on Sunday. But why did the NFL choose not to discipline these players? Was it, as was suggested by Rams coach Jeff Fisher, because these players were simply exercising their freedom of speech? The NFL does not have to adhere to the strictures of the First Amendment -- the First Amendment only prevents a state actor from restricting speech, it has no application to the private employer-employee relationship between the NFL and its athletes. And the league has routinely exercised its own freedom to not extend those freedoms to its players. So there may be another reason the rule-laden, speech-conservative league declined to discipline these players consistent with their own highly restrictive rules about expression. 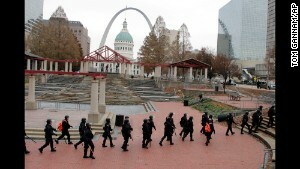 Cops to charge Michael Brown's stepdad? Perhaps they couldn't. Maybe this demonstration fell within a loophole—a loophole in a rulebook that is otherwise so harsh, it wouldn't survive the most permissive constitutional scrutiny. One look at the NFL rules confirms that safeguarding the free speech of its players is hardly a priority for the organization. After all, the NFL is a business, and it has to protect its invaluable brand. The rulebook is therefore practically festooned with strict uniform regulations, and constraints on player conduct. Rule 12: Player Conduct, Section 3 addresses Unsportsmanlike Conduct. Note 2: Violations of (b) or (c) (above), which occur before or during the game, may result in disqualification in addition to the yardage penalty. Any violations at the game site on the day of the game, including postgame, may result in discipline by the Commissioner. Note 4: Violations of (c) will be penalized if any of the acts occur anywhere on the field. These acts include, but are not limited to: throat slash; machine-gun salute; sexually suggestive gestures; prolonged gyrations; or stomping on a team logo. Note 5: Violations of (d) will be penalized if they occur anywhere on the field other than the bench area. It seems then, under the rules, abusive language, abusive gestures, baiting or taunting must be directed to opponents or someone related to the league to be prohibited. The Rams' gestures were not really abusive, baiting or taunting, and not directed to anyone specifically (other than the audience). So although subsections (b) and (c) cover gestures and acts, the underlying intent, purpose and audience does not exactly match up. 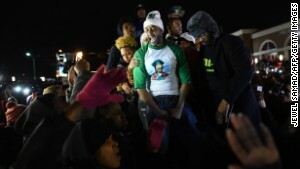 It's possible that the gestures constituted a prohibited demonstration under (d) or (e), either "premeditated or choreographed." Yet this entire section appears to relate to activity during the game, and is not included in the "pregame" provisions of Note 2. Bottom line? The NFL could probably stretch this section to apply to the pregame gestures by the players, but it would seem inconsistent with the in-game spirit of these rules. Another part of the NFL rules speaks more directly to a pregame political message like the "hands up" statement by the Rams players. "The League will not grant permission for any ... player to ... display, or otherwise convey messages, through helmet decals, arm bands, jersey patches, or other items affixed to game uniforms or equipment, which relate to political activities or causes..."
At first blush, this section is more directly on-point than prior rules designed to address taunting and excessive celebration. This was, without question, a pregame, political or social message, done without prior approval. Still, look at the fine print: players are prohibited from conveying personal messages ... either in writing or illustration. Had the language of the rule ended at "messages," the "hands up" would have been prohibited. But it didn't. The sentence continues by limiting the proscription to messages "either in writing or illustration." Well, the "hands up" gesture certainly wasn't in writing. That leaves "illustration." Is an illustration limited to a drawing or cartoon, though? The rule as written plainly limits the ban to written or drawn messages only. Gestures using only one's limbs are not included. So, could it be that the NFL accidentally limited itself in the rules? Or did it intend to give players some leeway with pregame political gestures? The former is more likely -- the rest of the rules are so strict, it defies logic to conclude the NFL intended to permit unfettered social commentary via gestures and choreography -- so long as the uniform rules were followed. The NFL has opted not to discipline the Rams players for the Ferguson message they conveyed on Sunday. Perhaps the NFL made a judgment call designed to avoid controversy after reviewing the tape. If so, this plan backfired -- and how could the NFL not have foreseen the response by law enforcement? Perhaps instead the NFL reviewed its own policy and realized that it missed a loophole in its infamously draconian rules on conduct and apparel. Had a player been disciplined and appealed, that appeal might expose the oversight, and then exacerbate the situation. Perhaps the NFL's support of free speech is a thinly veiled effort to save face. For now, we can't know for sure. But next year, if you notice some minor (but expansive) edits to the NFL manual, then that's probably as close as we'll come to an answer.